Lumbering Camp in Michigan winter, shortly after the Civil War has ended, is where we see our abused plantation wife end up in her run from the south. 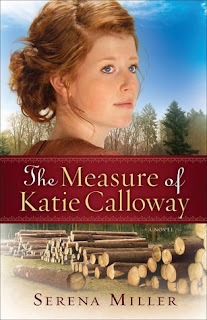 Katie Calloway flees Georgia with her young brother in tow, knowing full well if she stays that her husband will kill her. Violence still consumes him after the war, and Katie and brother Ned are his target. Life in the lumber camp is far from what Katie had on the plantation, cooking for a solely male camp of ‘shanty boys’. Robert Foster runs an honest, good camp of workers and Katie soon feels safe and needed within the camp environment. Katie plans to stick to her story that she is a widow and prays that her secret isn’t found out. Still married to Harlan, Katie has to fight the growing love she finds for Robert. Set in Michigan’s wonderland, Serena Miller describes the settings so beautifully that you feel you are walking in the tall pine forest, with the chill of the morning in the air, smelling the remnants of Katie’s amazing cooking! Michigan is ‘home’ to me, where lumbering was the history of the towns nearby. Dangerous and difficult for the men and very few woman that were in the camps, I enjoyed the tribute Serena Miller pays to the old times of lumber camps, bringing rich history to the reader as well as deep emotions from her characters.